Batman is ready to begin an autopsy on Wally West, but can’t bring himself to make even the first incision. Bruce Wayne is wearing down, and you can quickly see how much of a toll all this has taken on him. During a battle alongside the Justice League, Batman begins to experience brief hallucinations due to having gone days without sleep. Her mission is to somehow resurrect her brother. As the issue comes to an end we see Hank Clover attached to something that looks like Bane’s venom, with a clearly deranged Gotham Girl expecting big results. Before we get to the story, just a quick (or not so quick) rant about page counts in DC books. Since DC Comics went to a lower page count at the start of REBIRTH, there has been an odd phenomena that has affected a lot of books. Some of the stories felt like they had the perfect page count, filled with action and intrigue. Others felt too rushed, like they could have used a few more pages to round out the tale. This one fell somewhere in between. We whipped around a lot of locations in a brief period of time, with that first jump from the Batcave to the JL fight against the Amazo prototypes seeming just a bit jarring. The reveal of Gotham Girl seemed to fit this category as well. We only saw her in the shadows saying, “Run”. No real indication that Bats recognized his adversary. Yet when Barry arrived, Batman went straight into, “yep, knew who she was, here’s her life’s history”. Only then do we get Gotham Girl into the story in a recognizable way. It all happened a bit quickly (no pun intended for a Flash crossover). Josh Williamson remains one of my absolute favorite writers, and this is not meant to reflect on his script writing. This is more about the limitations of the 19 page format DC has been running since REBIRTH. All that said, this is an excellent set up for the crossover in terms of establishing the wear and tear on our protagonists. We quickly see how the loss of Wally West has affected both Barry and Bruce, and we see how single-minded each has become. Their relationship is being severely tested by all of this, which is the point of the crossover itself. It is a bit ironic that Barry, who has been keeping secrets to his own detriment in the pages of his own book, is calling out Bats for doing the same thing. Bruce Wayne may be the one person in the DCU who hides important facts more than Barry Allen. That’s a great recipe for distrust, and if it continues will be sure to impact how Bruce and Barry work together…if they continue to work together at all. I like this overworked, overstressed, over-tired Batman. We see here how Bats acts when he is so overwhelmed that he starts to break down a bit. That has been explored before, most famously in the Knightfall arc that ended with Bane breaking Batman’s back. But, the way it’s explored here also makes perfect sense. 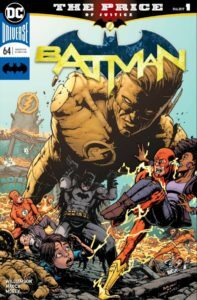 The artwork is excellent- and I especially admire any artist who tries to take on the entire JL at one time, and who takes on two iconic characters in Bats and Flash through an entire issue. Keeping the characters working in the styles we are accustomed to watching is not easy – but it’s handled well here. Kudos to Guillem March (and excellent color work by Tomeu Morey). Joshua Williamson has given us a solid script overall for the start of this crossover, and I am looking forward to next week’s installment. SUMMARY: I’ll give this first installment an 8/10 – but that’s just my opinion. What do YOU think? Leave your comments below!